...or: "But where will we PUT it?" 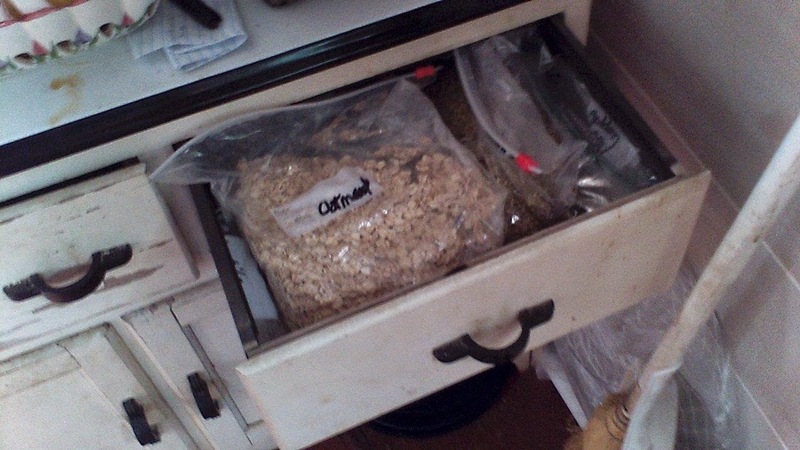 Since I'd had a couple of inquiries, I thought I would give you guys some tips we've found helpful in the galley about...well...where to put stuff. Galley cooking always amazes me. I've been in numerous boat galleys that are better laid out, better equipped, and far more usable than most suburban kitchens. This may be a factor of necessity, long experience of boaters using inadequate facilities to try to feed hungry crews, or just an example of some of the extreme cleverness of boatbuilders. Regardless, Galleys tend to work, and often rather well. Getting stuff out of your way but still having it accessible is a big part of making a kitchen work. If you have to squat, dig, or tunnel to get to everything you need every time you need it, you may find yourself ordering pizza a lot. Here's some of the things we've done that seem to work. We rigged a hanging potrack over our stove/hearth area, suspended from the vent hood itself. 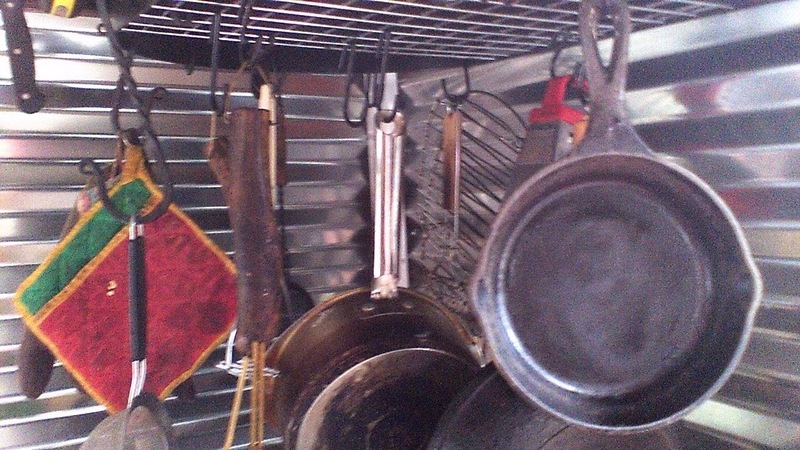 This not only keeps stuff handy, the warm airflow keeps our cast iron pots dry and in good shape. It took a while to learn where to set the hooks in the suspension grid so we didn't bonk ourselves or create a glockenspeil every time the boat rocked, but once we got the positioning sorted out, it worked well. 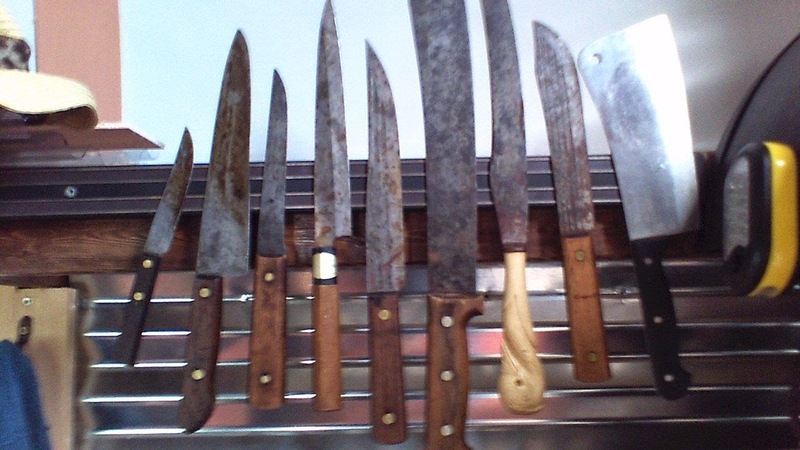 A heavy magnetic knife rack keeps the knives available, but safely out of the way. As we prefer carbon steel knives to stainless (because they will actually hold a freaking edge, thank you very much) they have to stay dry, and the magnetic mount allows air to circulate. Shallow shelves with windows allow you to see what you're looking for without digging, and positive catches on the doors keep things in place. This doesn't have to be marine furniture. 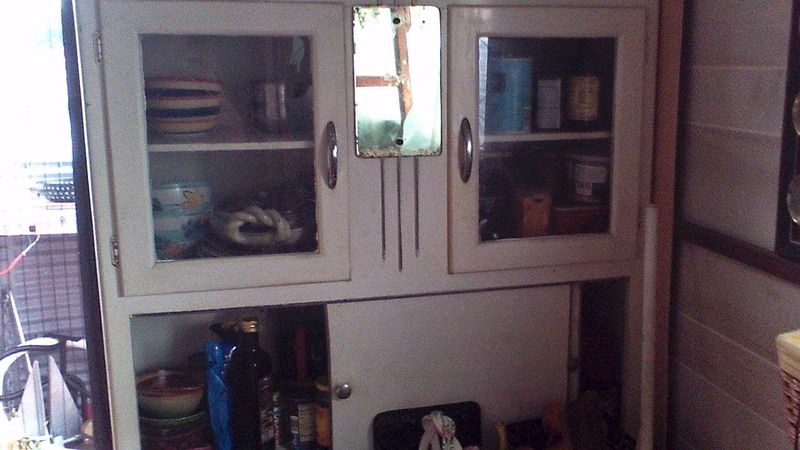 We found this antique breakfront works beautifully for storing our dishes and canned goods. When we first came aboard, all our spices were in large glass containers. Attractive, but bulky and damn heavy. Though it's somewhat inelegant, we've shifted them to ziplocks in a drawer. One drawer holds what it used to take an entire shelf to hold, and does it securely. 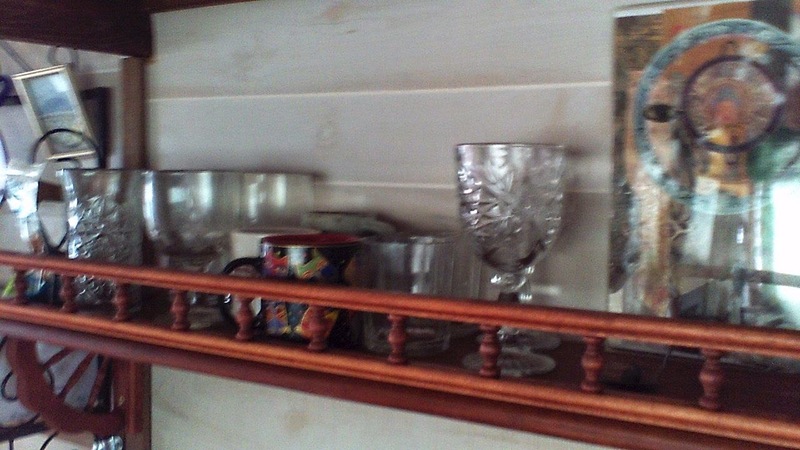 And, lastly, though shelves on a boat would oft be a disaster, shelves with a retaining rail work just fine, even for our glassware and artwork. Oh, hey, speaking of galleys, check out our new small spaces cooking blog onboardcooking.blogspot.com HERE. And don't forget to visit Morgainne's blog of art on the water, Life, Art, Water.